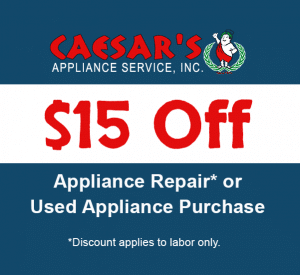 Caesar’s Appliance Repair provides fast appliance repair Orange County service on many major brands. We service all large kitchen and laundry appliances, including refrigerators, dishwashers, ovens, washers, dryers, and more. Our appliance repair technicians have extensive experience with a variety of models from major and high-end brands. Whether you need Sub-Zero refrigerator repair or Whirlpool washer repair, we can help. Whatever your appliance need may be, we're here to help! When you need fast, affordable appliance repair, don’t wait! Call Caesar’s today to schedule service. We are your #1 Rated Orange County Appliance Service Company. Interested in purchasing an appliance from us? Learn more about our Used Appliance Store and Appliance Parts Store.